With low monthly payments and a low interest rate, Omni Pool Builders as your choice designer is a win-win! Consider our finance option in lieu of making one lump sum payment. The investment that you make in your swimming pool or spa is an investment that comes with family fun and excitement. A swimming pool will keep the friends and family happily entertained and this can also be a great asset if you decide to sell your come, later-on down the road. 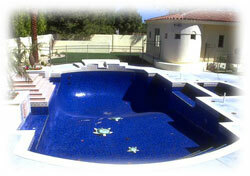 The long-lasting qualities that come with swimming pools are purely an investment with a happy ending. We offer 100% financing with no down payments. If you are on the market for a new home and would like to add a swimming pool, you can simply, add the cost to your first mortgage. Ask for our financing options. The many functions of landscaping include beauty, privacy, wind protection, shade, and segregating play and garden areas from poolside. It's important to consider what plants will be around your pool. Some plants, shrubs, trees and flowers make better choices than others when your paradise includes a new pool. 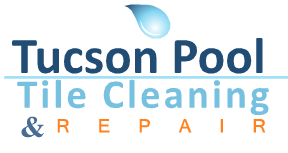 When choosing all the options for your pool, the most important consideration is, "How will I clean my pool?" There are many cleaners on the market today, none are more automated and achieve the results of a Paramount In-floor pool cleaning system. In-floor systems require almost no maintenance and distribute pool chemicals evenly throughout the pool. 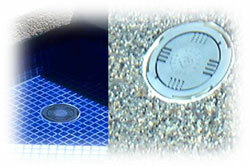 Paramount Pool & Spa Systems offer in-floor cleaning and circulation systems for concrete, vinyl, and fiberglass pools. With a Paramount In-floor system your pool will clean itself so you don't have to. When it comes to decking you might want to think big. 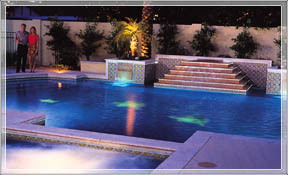 Poolside pleasure is an important component in the over all enjoyment of your pool. Think about poolside seating, lounges and shaded havens. Rolled bond beam, a technique that allows landscaping to come near the edge of the pool, can provide a nice alternative to decking when space is limited. As for the pool interior, there are many beautiful surfaces available for your pool interior, contact your us to view what's available. Some finishes look like natural stone, while others can help enhance the natural beauty of water. Not only does an elegant water feature bring years of extra enjoyment, but also it's an investment that adds to the value of your new pool and home. 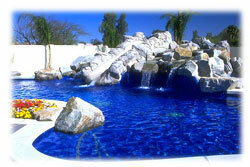 Beautiful rock waterfalls, therapeutic spas, sparkling fountains, raised spillways, cozy party coves and more! Exciting water features are the final touches you need to create that perfect setting. Solar can often double the time you spend in your pool each year. This provides you more time for fun, exercise and relaxation in your pool. 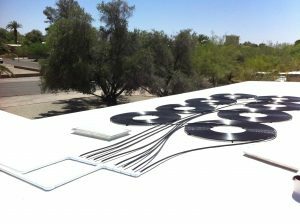 A Solar Pool Heating system will double the value of your investment.